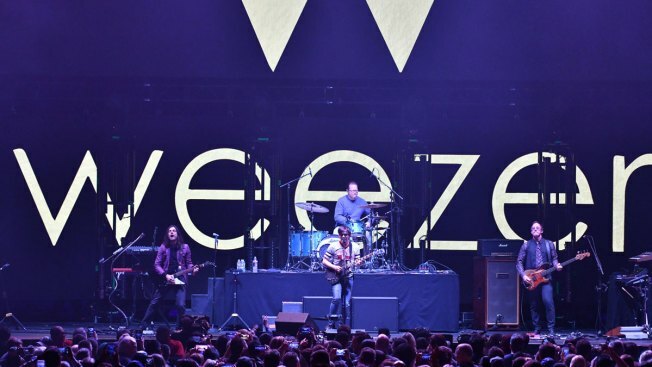 (L-R) Musicians Brian Bell, Patrick Wilson, Rivers Cuomo and Scott Shriner of the band Weezer perform onstage during the iHeartRadio ALTer Ego Show at The Forum on January 19, 2019 in Inglewood, California. On the heels of Weezer's mega-successful version of Toto's "Africa," the band has surprise-released a full album of covers, according to NBC News. "The Teal Album" features renditions of such 80s hits as A-Ha's "Take On Me," Tears for Fears' "Everybody Wants to Rule the World," The Eurythmics' "Sweet Dreams (Are Made Of This)" and Michael Jackson's "Billie Jean" in addition to classics from the 60s and 70s like Ben E. King's "Stand By Me" and ELO's "Mr. Blue Sky." Pop and metal are also represented on the album with covers of TLC's "No Scrubs" and Black Sabbath's "Paranoid." The covers collection comes ahead of a new album of Weezer originals. Dubbed "The Black Album," it's slated for release on March 1 and was produced by TV On The Radio's Dave Sitek. Its lead single, "Can't Knock The Hustle," is a hit at Alternative Radio and the band's 16th song to chart in the Top 10 at the format. Weezer hits the road this spring for an arena tour with the Pixies and is set to play Coachella's main stage in April.